While fans impatiently await the trailer for Marvel's Thor: Ragnarok, this week's print edition of Entertainment Weekly gives fans their first look at Thor (Chris Hemsworth) with his new look, along with Hela (Cate Blanchett) and Valkyrie (Tessa Thompson). We also have new details from Chris Hemsworth, producer and Marvel Studios president Kevin Feige and director Taika Waititi, who offer new insight into the story. What most Thor fans will notice right away in the photo, is that Thor's flowing blond locks have been shaved off. Marvel fans got their first glimpse at this Asgardian warrior in 2011's Thor, before he returned to team up with Earth's Mightiest Heroes in the 2012 blockbuster The Avengers. He returned in 2013's Thor: The Dark World and 2015's Avengers: Age of Ultron, and in all four of those movies, Thor always had the long blonde hair most had come to expect from this iconic character. While the details behind why Thor gets a huge makeover haven't been revealed, Chris Hemsworth explained to Entertainment Weekly that he was definitely grateful for this new do. "It was nice not to have to sit in the makeup chair for that hour each morning. It felt like a rebirth for me as the actor but also as the character." It was confirmed in December that Thor will be visiting the iconic planet of Sakaar from the Planet Hulk comics, after he gets banished from Asgaard by his villainous brother Loki, who has teamed up with new villain Hela. Thor ends up on the planet of Sakaar, which is where he finds Hulk (Mark Ruffalo), who has reinvented himself as a gladiator. Both Thor and Hulk are reportedly forced to square off in battle, but it has also been widely reported that they end up going on a "cosmic road trip" together. Here's what producer Kevin Feige had to say about keeping the story fresh for this third installment of the Thor franchise. "I have a belief that if you're lucky enough to get to part 3 of a franchise, it is your obligation not to fall to threequel-itis." Another surprising element of this cover photo is that Chris Hemsworth's Thor is not holding his iconic hammer Mjolnir, but rather two large swords. This could serve as confirmation of a rumor that Hela destroyed Thor's hammer before banishing him from Asgard, but that hasn't been confirmed. The site also caught up with Cate Blanchett, who revealed that Hela was accidentally unleashed from a prison. Here's what the Oscar-winning actress had to say about her new character below. "She's been locked away for millennia getting more and more cross, and then, with a mistake, she gets unleashed and she ain't getting back in that box." 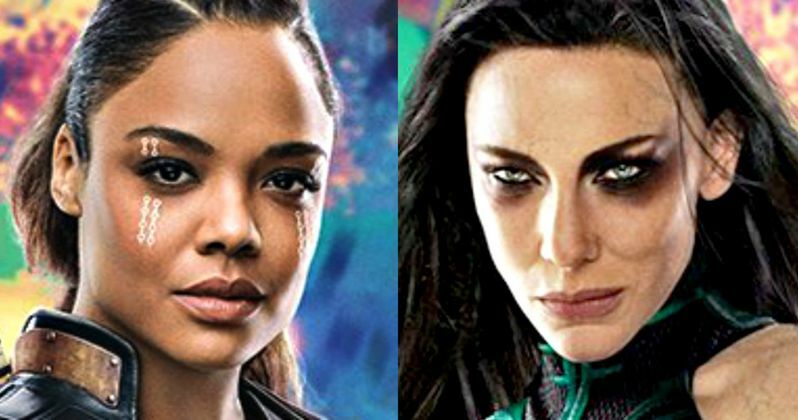 The actress also revealed that she trained with iconic stuntwoman Zoe Bell to play Hela, and she also learned capoeira, a Brazilian martial art discipline, to prepare for the role. Fans had long been waiting for a big-screen adaptation of the Planet Hulk comics, and while it seems a straight-up adaptation isn't in the cards, Thor: Ragnarok will be the closest fans will get, incorporating a number of elements from that comic, including the planet of Sakaar, which is located near a wormhole in the comics and becomes a planet that houses refugees from other dimensions, and one that plays host to gladiator games, which Thor is forced to compete in. Here's what Chris Hemsworth had to say about Sakaar below, while also discussing how director Taika Waititi brings a comedic blend to the story. "Sakaar is basically where every wormhole across the universe dumps out its trash, so you get people from all walks of life with all sorts of incredible abilities and powers. No one cares what prince or king Thor may have been in another world. Also, his strength is pretty easily matched with those he finds himself amongst. Taika has such a quirky, left-of-field sense of humor, which forced all the characters and the tone of the whole story to head in a new direction. Each day we were like, 'Are we pushing it too far? Are we allowed to have this much fun?'" There were previous reports that the original script by Christopher Yost and Craig Kyle was the darkest story ever tackled by Marvel, which is reportedly why Taika Waititi, best known for quirky comedies such as What We Do In the Shadows and The Hunt For the Wilderpeople, was brought on. While it remains to be seen when we'll get to see the first footage, Taika Waititi made it clear that this new Thor movie will not be a broad comedy. Here's what the director had to say below. "I think sometimes people mistake a tonal shift as 'We're just going to make some ridiculous broad comedy where no one gives a s- what happens and everyone gets stoned and sits around talking about saving the universe,' We want people to care what happens and care that the hero succeeds. I think tonally it's like a slight shift. I don't feel nervous. I feel good about it." The cast of Thor: Ragnarok also includes Karl Urban as Skurge}, Jeff Goldblum as The Grandmaster, Idris Elba as Heimdall and Anthony Hopkins as Odin. It was also recently confirmed that Benedict Cumberbatch will return as Doctor Strange, which makes sense since the Doctor Strange post-credit scene tied into Thor: Ragnarok, with Thor coming to Stephen Strange seeking help in finding his father. Take a look at the new EW cover for Thor: Ragnarok, as we get ready for the November 3 release.